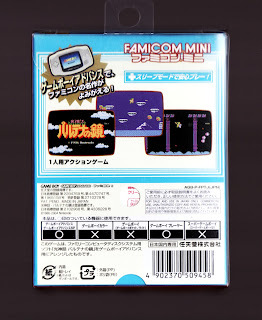 In my humble opinion, anyone who wants to call himself (or herself) a masochist should be forced to play Hikari Shinwa: Parutena no Kagami, aka Kid Icarus, on a GameBoy Micro before being allowed to use that moniker, as I can't imagine there are many more painful experiences in life than playing this tough-as-nails adventurer-platformer-shooter on a teeny tiny screen. So, why did I buy it? I actually kind of like playing this challenging title, to tell you the truth--or at least I do when I play it on a console attached to a nice-sized TV. Another reason I bought it: I liked the packaging in general and the yellow cartridge in particular. Unless you're a huge fan of this game or of banana-colored GameBoy Advance carts, though, I'd highly recommend passing on this release and picking up, say, the Wii Virtual Console release instead. That way, you'll be better able to appreciate--and appropriately deal with--the perilous jumps of its unidirectional overworld stages and the similarly onerous travails (Eggplant Wizards, hello!) of its cavernous underworld ones, both of which feature fairly unique-to-the-platformer-genre elements like credit-card-accepting shops, life-restoring springs and chest-filled treasure chambers. Ha! 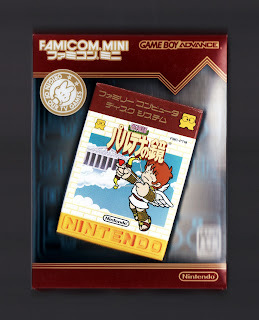 Arino had a hard time with Kid Icarus, eh? What were his main complaints? For him, the heart level up system took some time to get used to, trying to use the mic trick to get a discount in one store backfired on him and most of all, the Grim Reapers were his biggest roadblock for most of the game but he managed to beat it. Oh and yes I have played it, just I'm gonna have to build up a lot more fortitude to ever try that again. I especially like your last sentence, Motherplayer :) I understand needing to build up your fortitude to play and especially to beat this game, BTW. I played it -- for the first time in a very long time -- shortly after it was added to the Wii VC a few years ago, and for the first few days I honestly believed I'd never get past the first few stages. Once I finally made it past them, though, things improved greatly, and I quickly made my way through the rest of the game. Not easily, mind you, but quickly. Anyway, I don't know if that will be true for everyone, but I do think the game's first stages are more difficult than later ones. Oh I know the feeling. For really hard games, even getting past 1 stage would feel like such a accomplishment. Usually for me it would just drive me to keep playing. In the case of Kid Icarus, specifically, I refused to give up while playing this version and the Wii VC version because I knew I had beaten it many times as a youngster. The one game I always wanted to play as kid and never did. I did play it as an adult many years later, but it just wasn't the same. Hey there, Blake! Yeah, I have a feeling it's good to own a pair of nostalgia glasses while playing Kid Icarus -- or the original Metroid, The Legend of Zelda, etc. That said, I think it can at least be appreciated even if you didn't play it as a kid. Sure, it's a bit rough, and difficult and cheap, but it's also pretty interesting and unique, in my opinion. Also, the graphics, while obviously quite dated by now, are still really well drawn and colorful -- something most people can appreciate, I think. Granted, I love old, pixel-based games. If that's not your thing, you may not be able to enjoy Kid Icarus (or other games of the era) regardless of how unique, etc., they are. Ah, you're hoping there will be a new Kid Icarus for WiiU? I could go for that!